We've had a lot of fun with the highsec miners over the last couple months. Without their daily torrent of tears, there would probably be a lot fewer posts on this blog. But have you ever wondered what happens to the miners after MinerBumping makes them famous? New Order supporter Ruth Moufang sent me the log of a conversation she had with an alliancemate after she saw his failures highlighted on an old post. 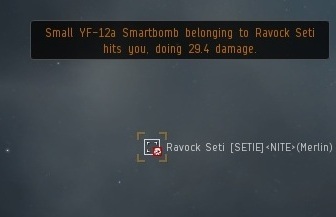 The rebel in question was Ravock Seti, whose claim to fame was an attempt to suicide gank my Invincible Stabber in Kino by using a smartbombing merlin. An unusual fit. But at least he used named smartbombs for maximum damage. Ruth Moufang > so you tried to fight the Savoir of High sec ? Ruth Moufang > James 315 ? Ruth was curious if Ravock had any explanation for his dastardly deed. And had he seen the post in which his failure was publicized? Ravock confirmed that he had gotten his share of razzings from buddies about the failed gank attempt. As I've often said, people would be surprised by just how many highsec carebears are avid readers of this blog. But Ravock seemed very confident about future attempts to destroy my ship. Winter is coming, indeed. Ravock explained that originally there were plans for a fleet to gank me. His words are a little ambiguous, but it seems to me that Ravock began to fear the group may have been infiltrated by an Agent of the New Order. Ravock lost his patience and launched his attack solo. But you know what this means, don't you? If Ravock hadn't been so trigger-happy, we may have gotten to see an entire gang of smartbombing merlins! Ruth Moufang > ban you mean ? Ruth Moufang > what incident ? 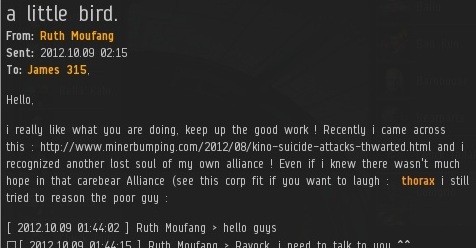 Sad but true, there are still people who believe the false rumors about my being banned from EVE, even after all this time. The "auto-expel" thing is a new wrinkle to the rumor, and since I'm obviously still playing EVE, it's now a 24-hour ban instead of a permaban that they think occurred. A great study in how rumors can adapt and evolve--moreso than carebears, it would seem! If the Seti brothers ever happen to read this post, I would offer them this advice: Ditch the attitude. Don't put your faith in smartbombing merlins, winter expansions, auto-expulsion, or guys named "keelum" with torpedo teeth. Put your faith in me, the Code, and the New Order. You'll be better for it. I *would* however, like to see a gang of smart-bombing Merlins. Just to say I'd seen it - a story to tell the grand kiddies, yanno? It's because of people like Ravock, that I really wish I had the guts to ruin other people's day. But I just always hesitate when it comes to harassing carebears, even if they deserve it... Maybe minimizing Local would solve all my problems? It is lovely value sufficient for me. In my view, if all site owners and bloggers made excellent content material as you did, the net will likely be a lot more helpful than ever before. Thanks for this posting i would love to come back on this site. I'm curious for your next post. Wishing you best of luck..